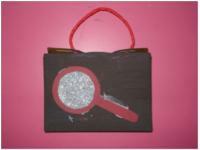 Children will be using their crafted magnifying glass (see educatall club) throughout this theme and beyond. 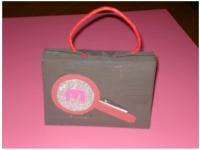 Why not create a cute detective briefcase they can carry it around in? Add a small notepad and pencil and they'll have a complete detective kit to sleuth around with! 1. Gather your materials. You will need a small cardboard box (the size of a box of granola bars), green and red paint (to create brown paint), a paintbrush, an aluminum pie plate (for mixing the paint), a Fun Foam sheet, a glitter Fun Foam sheet, scissors, white glue, a hole-punch, and a pipe cleaner or other material which can be used to make the handle. 2. 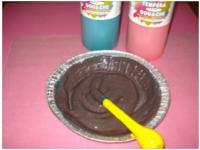 Mix the red and green paint together until you obtain the desired brown color. 3. 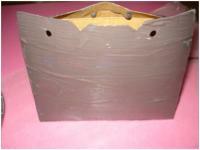 Paint the cardboard box with the brown paint. If your box is dark (like mine was), you may need more than one coat of paint. Let dry. 4. 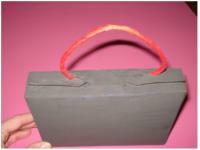 Use the hole-punch to make two holes in the top of the box. 5. Thread your pipe cleaner through the holes and secure with knots. 6. 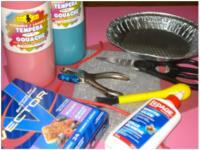 Cut a magnifying glass shape out of the regular Fun Foam sheet. 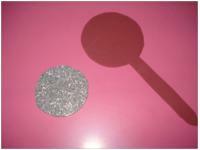 Cut a circle out of the glitter Fun Foam sheet. 7. Glue the circle on the magnifying glass shape. Glue the magnifying glass on your briefcase. 8. 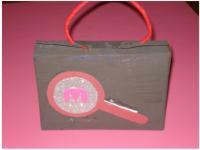 If you have Fun Foam letters on hand, children will love to add the first letter of their name to the magnifying glass. My daughter decided she was "Detective M".